Looking for a more modern reverb? XFX Reverb is a high quality Feedback Delay Network reverberator in the VCV Rack format. The algorithm has rich feedback with smooth decay for a modern hall-like reverb character. Blamsoft brings their experience creating high quality plug-ins to VCV Rack. XFX Reverb will soon become your go-to reverb module. The available parameters allow you to dial in a wide variety of reverb textures. XFX Reverb features separate low and mid decay times that can be tuned with a crossover. In addition to typical pre-delay and damping, it features modulation rate and amount for adjustment of the liveliness. The decay times go up to 32 seconds, great for ambient music. XFX Reverb is based on the popular Zero Reverb plug-in with added modulation. These examples are first dry, and then processed with reverb. 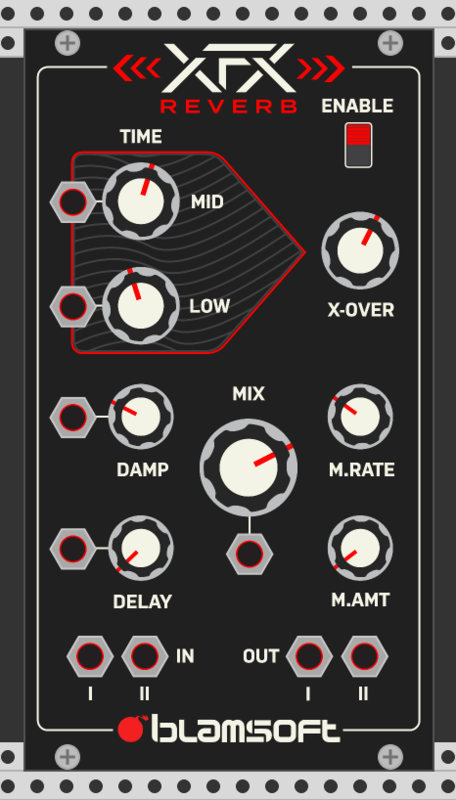 XFX Reverb is a module that can be downloaded for free in VCV Rack’s Plugin Manager.